Students at an Oxford University college have backtracked after banning the Christian Union (CU) from their freshers' fair. Students at Balliol stopped the CU from attending the event last week because they wanted it to be a "safe and secular space". Organisers have since agreed allow religious groups at future fairs. The umbrella organisation for Christian Unions in the UK said the dispute had been "amicably resolved". The Cherwell student newspaper reported the JCR committee (junior common room committee) was concerned "every major belief system" would not be represented at the fair for new students. 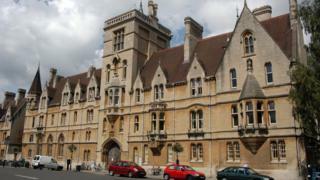 A spokeswoman from the Universities and Colleges Christian Fellowship said: "Balliol College JCR committee took the decision to prevent Christian Union representatives from attending its freshers' fair on the grounds that they wished the fair to be a safe and secular space." She said it was "a pretty rare experience" and added: "Most student unions are fair-minded and enjoy a good relationship with the CU in their university." Balliol College said it was pleased "the students themselves have now resolved this matter" after the JCR voted to prevent any organisations being banned in future. A college spokesman said: "The Christian Union will be offered a stall at future freshers' fairs.